Wisconsin Badgers star Frank Kaminsky was named the John R. Wooden Award winner Friday as the nation's most outstanding player. The award was presented in Los Angeles during "The College Basketball Awards Presented by Wendy's" show on ESPN2. There was a bit of confusion earlier Friday when two advance releases were sent out by award organizers. One said Kaminsky would win the award, while another referred to Duke's Jahlil Okafor as the winner in its headline, but included text about Kaminsky. "Two of the draft releases we prepare were incorrectly issued to the media," organizers said in another release Friday afternoon. "The winner of the 2015 John R. Wooden Men's Player of the Year Award will be announced tonight as part of the College Basketball Awards." 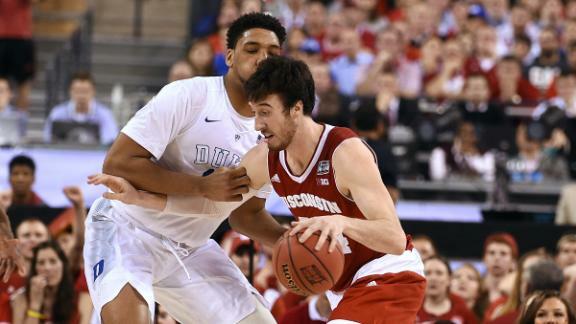 Kaminsky averaged 18.2 points, 8.2 rebounds, 2.6 assists and 1.5 blocks per game in leading the Badgers (35-3) to the national title game, where they lost to Duke. Kentucky's Willie Cauley-Stein, Notre Dame's Jerian Grant,Ohio State's D'Angelo Russell, Kaminsky and Okaforwere the finalists for the award. By winning the Wooden Award, Kaminsky completes a clean sweep of the five major player of the year awards. The 7-footer also earlier won the Naismith Award, the Oscar Robertson Trophy and the NABC and Associated Press player of the year awards. Kaminsky is the first Wisconsin player to win the Wooden Award, and he is the first winner from the Big Ten since Michigan's Trey Burke won in 2013. Wisconsin forward Frank Kaminsky talks to Rece Davis after winning the Wooden Award as the nation's top college basketball player. Chris Broussard explains how Jahlil Okafor, Frank Kaminsky, Sam Dekker and Justise Winslow will acclimate to the NBA, and identifies which pro players they are comparable to.